Intense Episode Last Night Led To Internet Diagnosis Today: Night Terror! Last night around midnight about 1 1/2 hours after going to sleep I felt like the building was collapsing around me everything was tilting and I jumped out of bed screaming and running to escape. Catching my breath in the hallway I woke up and realized it wasn't happening. My heart was racing once it slowed down I went back to bed and fell back to sleep immediately. Classic textbook night terror except I wasn't supposed to be able to remember the dream or event, but I did. The next morning I first googled nightmares and sleep disorders and I think I had a night terror. I'm 47 years old and this isn't the first time I've run to save my life during my sleep. I used to think it was just sleepwalking. I often "dreamt" that the ceiling was falling down and very often jump out of bed and leave the bedroom but this was the first time that I screamed so loudly I was afraid the neighbors would call the police. I think the night terrors which I have had my whole life and didn't have a name for are intensifying both in frequency and level of fear. Earlier night terrors I was scared but last night I was terrified. So I'm wondering if I should maybe see a professional psychologist? My stress level and general life situation hasn't changed to explain the new level of intensity. I don't drink alcohol or smoke or eat late and I exercise regularly. I don't want to disturb my neighbors or wake up to the police, so what should I do? Comments for Intense Episode Last Night Led To Internet Diagnosis Today: Night Terror! I have also experienced these Night Terrors! Words can not describe the fear-impending feeling you get when you wake up in a panic attack. It felt like I was disconnected from reality and that something was out to get me. It felt like somehow the world was going to end if I did not leave the house or wake up fully. One instance at age 21 I was in a relationship that caused an extreme amount of stress because of an ex girlfriend and the baby she shared with my current fiance. I woke up heart pounding, sweating, & wimpering- with eyes open! I was sorry, naked in bed at the time but it didn't matter- I got straight up and started pacing around the room, then I ran out into the living room and kitchen trying to "wake myself up completely" I knew what was happening because of experience before but as always it seems you can not be consoled enough to feel 'normal'. It ended abruptly and I felt so embarassed. Even when I do wake up sometimes I'll still have the fear & panic lingering for hours. I often called my sister so she could talk me down & distract my mind. I've had about 10 episodes total since my adolescence - ones where I would wake up the whole house to one where I ran up the stairs of my house on all fours like an animal. Nice to hear others can share their experiences. Love to you all. Ive never had night terrors until the last 6 weeks. Had a thoughyear..lost my job, relationship problems....etc. However, i feel something is after me. Within minutes of falling asleep, it starts.....room becomes distorted, noises only i can hear. Every night....except for a 4 day trip to chicago for work! I know I'm dreaming.....but the fear is paralizing! Now, twice I've heard a young girl screaming and enticing my son....calling his name over and over. I get out of bed and check him and the house. I live with 5 other people who have no experieces....or hear these things. Last night i heard a baby screaming....went downstairs....kids were up and thought i was crazy. Now I'm beginning to believe myself. I've lived here 3 years....and was a new home....anyone else? This happened to me at a hotel and I had a dream (I'm not sure if they are dreams or what) that my room was shrinking and I jumped out of bed terrified and ran to the door and was about it to run out into the hall when I realized it was just a dream. By definition, folks who suffer from Night Terrors can't remember what's frightening them. I've been dealing with my son's severe Night Terrors for almost a decade. We had to video tape him before he would believe that anything was actually happening to him at night, despite the fact that we stopped him on several occasions from jumping out windows and running out of the house in terror, screaming and begging his imaginary assailant for mercy. Night Terrors occur during non-REM sleep. REM Behavior Disorder occurs during REM stage, the stage where you normally dream but are prevented from acting out your dreams by normal sleep paralysis mechanisms. 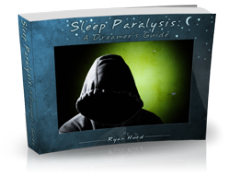 For those without the proper paralysis mechanisms, you can have intense dreams or nightmares and actually act out those dreams or nightmares. Comedian Mike Birbiglia is an example of someone with REM Behavior Disorder. The distinguishing factor is that REM Behavior Disorder sufferers actually remember the dream. If you're "lucky" enough to capture one during a sleep study, you'll know right away. The novelty and disruption of normal routine virtually guarantees that you won't capture one during your sleep study, however. My son's had two and though they've caught sleep apnea and abnormal sleep architecture, they've never caught an actual Terror in progress. Even though they caught essentially "good" nights, they were still able to catch enough to give us hints on how to decrease intensity and frequency, but not eliminate the Night Terrors. Alternatively, you could be having regular old panic or anxiety attacks. In any case, seek help from a professional, although don't get your hopes up. We've had limited success in decreasing the intensity and frequency of his night terrors. Mike Birbiglia has to sleep in a zipped up sleeping bag wearing mittens to prevent negative consequences from his issue. 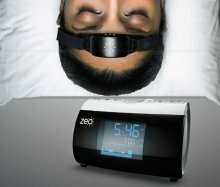 Finding a sleep center that is more than a front for the CPAP manufacturers is difficult. Even if you find a sleep center that actually understands your disorder, we've had difficulty actually getting the doctors to engage. For my son, most want to say that he'll eventually grow out of it (even though he is far past the stage where most kids grow out of it) and delay any detailed diagnosis or treatment. You'll probably get the same advice we get. Practice impeccable sleep hygiene. Don't drink caffeine. Reduce your stress. Come back in a year to let us know if it's any better. One year later, you'll hear the same. To be fair, that advice is all they really can do. Melatonin helps some folks. The only drugs that help are extremely potent anti-psychotics which can have long term repercussions on your brain chemistry. We're not entertaining the use of those on our adolescent. So... practice your sleep hygiene and do your best to "werewolf-proof" your bedroom. (No weapons, no breakables, baby-proof locks on the windows and door that are easy to open if your awake but seem to be impossible to open while asleep. Mittens (no fingers) for sleeping. I wish you all the best of luck and sweet dreams. It's been about three years since my last night terror/anxiety attack. I've learned to de-stress my life, escape in my mountain home, and get back to basics. I also live in a state where medical marijuana is legalized with a prescription, which I have. It has helped me relax for once in my life and also to reach that deep sleep I desperately needed. The key to no night terrors in my world, is to not let the bad things in your life destroy you, but let it better you. Learn to take time outs to breathe and regroup. Anxiety and stress cause cancer and also countless illnesses.. and in my personal experience they can cause a lot of the 'freak outs' we have while we are supposed to be sleeping peacefully. Also please keep in mind.. do not be so hard on yourself. If that is one thing that might have contributed to my anxious life, it's that I never thought I was good enough. You are amazing and WILL get through this. Just concentrate and have hope. 'the faith of a mustard seed can move mountains'.